THE MATERIAL OF FILM AND VIDEO IS LIGHT, SO WE USUALLY CREATE DARKENED ROOMS IN WHICH TO EXPERIENCE ITS ART. 4A’S CINEMA ALLEY HOWEVER MAKES USE OF THE NIGHT, ERECTING A LARGE OUTDOOR SCREEN IN SYDNEY’S PARKER STREET FOR ONE EVENING EACH CHINESE NEW YEAR FESTIVAL. NOW IN ITS THIRD YEAR, THE EVENT TRANSFORMS THIS CHINATOWN BACKSTREET INTO AN OPEN-AIR CINEMA AND SCREENS A SELECTION OF CHINESE VIDEO ART CURATED BY 4A DIRECTOR, AARON SEETO. 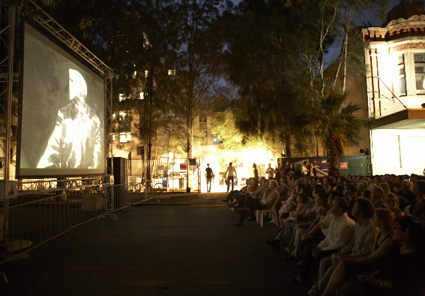 4A’s own laneway project, Cinema Alley is also a result of the gallery’s focus on community engagement, extending outdoors from the gallery and, this year, including screenings from their 2010 Animation Project with the local community. A major work in this year’s program was Jun Yang’s A Short-Story on Forgetting and Remembering (2007), made in the short film (or even short story) tradition of a first person narrator. Unable to sleep, the main character wanders the streets of Taipei at night, reflecting on a city built for an alternative history of China. “Everything here seems to be temporary, or at least built on something temporary.” CCTV images suggest a life recorded in pixels. Neon signs flicker, both confident and illusory, stuck in an endless performance of modernity. The film ends with the background sounds of Ridley Scott’s Bladerunner providing a popular reference point for this sense of mass amnesia and never-ending quest for the new. A less conventional exploration of memory, Factory (2003), by Taiwanese Chen Chieh-jen complicates the experience of time through experiments with pace, absence and repetition. Shot largely in a disused textile factory, the film intercuts images of old equipment and abandoned rooms with footage of the female former workers, back at their machines now seven years after the factory’s closure—the ghosts of a labour market after the tide of global capital has moved on. The interweaving of archival footage of factory workers produced by the Taiwanese government in the 1960s adds to this folding of time, of different eras experienced simultaneously in the apprehension of places and objects. Ou Ning and Cao Fei’s accelerated montage, San Yuan Li (2003), records the encroachment of Guangzhou’s urbanisation on a once rural village. The result of collaboration between 12 artists, all of whom collected footage, the film is an example of the documentary urge currently shaping much contemporary Chinese art and film—the drive towards archival projects amid so much change and destruction. The 45-minute San Yuan Li appeared in Cinema Alley in a shortened version (produced by Ou Ning) along with a brief explanation of the project. Shot largely from below, looking up between buildings to slits of sky, this rapid juxtaposition of the rural and urban conveys a sense of the unnatural in the speed of China’s urban development. Yuan Goang-Ming’s Floating (2000) was the simplest of the films screened, a short work about disorientation in which the camera is fixed on a repeatedly capsizing boat. We spin with the camera and, like an IMAX film or a ride at an amusement park, the film confuses our bearings. Wang Qingsong’s Skyscraper (2008) was screened for the third time in less than four months in Sydney—previously in Arena at Hazelhurst Gallery (RT100, p44) and Eye of the Dream at Customs House—but its final scene worked especially well in this context. The fireworks that burst into a celebration of China’s faith in modernisation looked particularly familiar (and just as ironic) in the Sydney night sky. Ultimately, these accidental reverberations stole the show: the neon of Taipei amid that of Sydney, the urban canyons of outer Guangzhou viewed from one within Chinatown. The move from the gallery and out into the open extended the work not only to new audiences but also to new ways of viewing. The focus of this year’s program on cities, histories and transformation made for a particularly rich array of resonances, stitching Sydney into the experience of the films and the films within the experience of Sydney. This nesting of different local spaces drew out the connections between them, suggesting their formation within shared global processes. Time and space were compressed and, for an evening, the soundtracks of urban Asia added to the white noise of Sydney.